It’s been a minute since I’ve talked about my transition from relaxed to natural hair! I thought I’d share a little what I’ve learned over the past 5 months. Relaxed fam, feel free to read along. You might get some good product info as well! I am a CPJ– certified product junkie! I always was, but I think this Natural quest took the junkism up to the next level! Right now, my favorite products are Shea Moisture, Oyin Handmade, Darcy’s Botanicals and Trader Joe’s brand conditioner. I’ll talk about my routine later. Additionally, I LOVE Henna! * I’ve tried it a few times already and try to do that every 3-4 weeks or so. 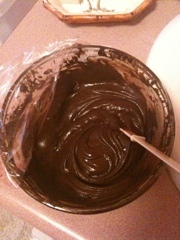 It’s a little labor intensive, but I think it made a difference in the strength of my hair. For those who aren’t familiar, Henna is like a natural protein treatment that can add strength, sheen, and help loosen curls while adding a slight “stain” to your hair (your hair will have barely-there reddish undertone in the sun and any gray hair will take on reddish color as well). The more you Henna, the stronger your hair becomes! I don’t think I’ll EVER use commercial color again! You can kick up the color of your Henna by adding hibiscus flowers for more of a burgundy color and cloves for more of a copper color (both colors noticeable in sun or bright light). I boil my hibiscus leaves in about 4 or ounces of water with a green tea bag and maybe 2 ounces of lemon juice. In a glass or plastic bowl, I mix the cooled, strained liquid with my Henna powder into a yogurt consistency and let it sit covered overnight at room temperature overnight. Before I apply to Henna to freshly shampooed and sectioned hair, I add a little honey to the mix (adds moisture and makes the Henna rinse out a lot easier) and apply the paste to every strand of hair. Cover hair in plastic wrap, and chill out for at least two hours to overnight. I wash it out thoroughly with water and ” shampoo” with cheap conditioner. 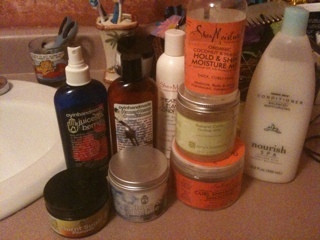 Then I follow-up with a protein-free, moisturizing (Trader Joe’s or Shea Moisture) conditioner for about an hour or so. Once that’s rinsed, I’m left with softer, shinier tinted hair. Anytime I shampoo and/or Henna, it takes a day or two for my hair to “bounce back” in terms of curl def, moisture and sheen, so I try to do that on Friday/Saturday when I don’t have any place to be right away. I also add a little glycerin to my products after a shampoo/Henna session and style as normal, which leads me to my daily routine—at least for now! At night, I dampen my hair with water or Oyin’s Frank Juice. I then take a little Shea Moisture Curl Smoothie and/or Oyin’s Shine and Define mixed with a little coconut oil (to seal in moisture) and twist my hair. I’m not neat about it, either— it’s just to keep my hair moist, in place and help curl definition. Pop on your bonnet and lights out! In the morning, I let the mist hit my hair in the shower, untwist and repeat the nightly process, just using a bit of the Curl Smoothie/Shine and Define. Once I fluff and style, I’ll seal again with coconut oil or Oyin’s Burnt Sugar Pomade. If I’m lacking curl definition, I use a wee bit of Darcy’s Coiling Jelly. I finish off with a couple of spritzes of Shea Moisture and keep it moving. 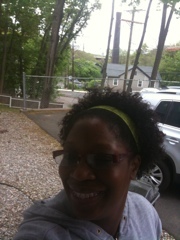 My hair won’t really hold a defined twist–it just curls up so I roll with her! Lol! 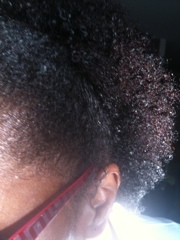 I am also fond of Flax seed gel**, thanks to Naptural85 on YouTube! I sometimes use this in place of water when twisting at night. I tried it recently and my hair feels less “product-y.” My 3c/4a hair has a tendency to be very thirsty and lose curl definition ifiI don’t follow my routine. I’m still trying to find a product/ combo that will keep my hair moisturizer and hold the definition but since this is working, I’ll stick with it. Suggestions, anyone? Shout out to all my natural sisters who are holding it down and bringing out the curls this/next month, including Wanda and Sophrina. It’s not easy to go through the process and then find a routine that works for you—-it’s like planting a garden–you are so excited about the of the results after all your hard work and feel blessed by what God has given you! If you have any questions about what I wrote here, feel free to post them! Thanks for reading and God bless you! **Quick Flax Seed Gel recipe: bring 1/4 cup of whole flaxseeds and 2 cups of water to a boil, when you see the gel come up, strain boiled mixture through a knee-high into a plastic container. If desired, add the essential oils of your choice, (I love lemongrass and peppermint) seal lid and put in fridge overnight to set gel. Gel should be stored in fridge and can last for up to 4 weeks or so. For more details and a neat video, see Naptural85 on YouTube. Great post auntie!! Right now, I’m still in the “I cant believe I actually CHOPPED it” stage. Im glad I did it though- the two textures weren’t happy with each other anymore. Now the REAL natural journey begins…. Thanks, Niece! I’m looking forward to your journey! It will mess with you from time to time, but hang in there! You look great! Aww, Cousin Blen! I am so proud of you as you journey within the Natural hair realm. *Screaming* As a Natural, I truly understand the routines and combos of products. This post was very refreshing. Even though, I haven’t done any Henna, it looks great on you! I see the difference. My Natural (Jai B) is now 1 yr and 5 months old!! Congrats, again! Thanks, Cuz! *clapping wildly* You were part of my inspiration, you know! I am equally as proud of you– your hair is fro-licious! When you get a sec, tell me what products you’re using. Muah!